« How to classify and search careers resources? This entry was posted on Tuesday, September 4th, 2012 at 16:13	and is filed under careers, e-learning 2.0, education 2.0, G8WAY, MOOCs, networking, Open Learning, Pedagogy, PLEs, Social networking, teaching and learning, Wales Wide Web. You can follow any responses to this entry through the RSS 2.0 feed. Both comments and pings are currently closed. 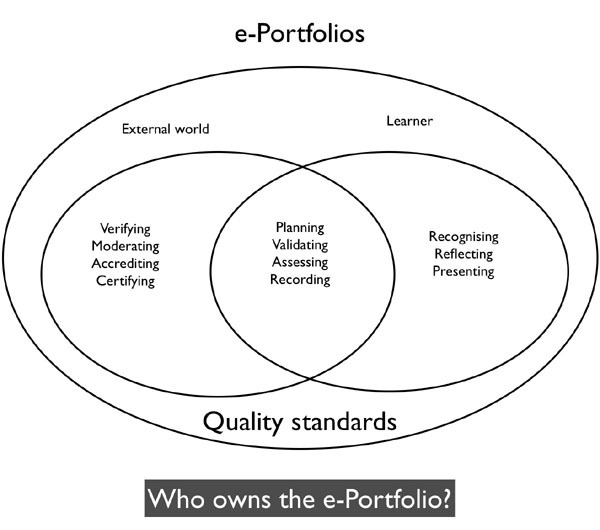 Hi Graham, having worked with ePortfolio Mahara but also Moodle courses since MOSEP times … I would like to add another point to the discussion on ownership of ePortfolios. Both a LMS and a ePortolio are part of a learners PLE, among many others. The point is that in a moodle course, it is stil the teacher who is in control – mostly… and we have cooperation, communication and collaboration among the students in a group. So its kind of the group’s virtual classroom BUT with still the teacher in control… if a student uses an ePortfolio for presenting, reflecting his own work and development and creating his own community then HE is the one to decide who he will show his entries to and who he is working with in a group. The teacher can only see what the student does when the student invites him to do so. This is the crucial point that many teachers cannot accept, they are so used of having e.th. under control ( one point why they like Moodle 😉 . And we also have the problem that the institution aka school does not understand why they should give a student access to his portfolio after having left the institutions… these are all problems of ownership in the actual sense of the word… so what we need is a real shift in mindsets to give more responsibility to students for their own learning… which students will also need to learn! So as you said we will have to live with the issues of control and power for some time- for sure!